The Metro Theatre was originally designed in 1929 by the Reid Brothers in the Spanish Colonial Revival style, and built by Samuel H. Levin. By the mid-1950s, The Metro became the original home of the San Francisco International Film Festival, the oldest international film festival in the United States. 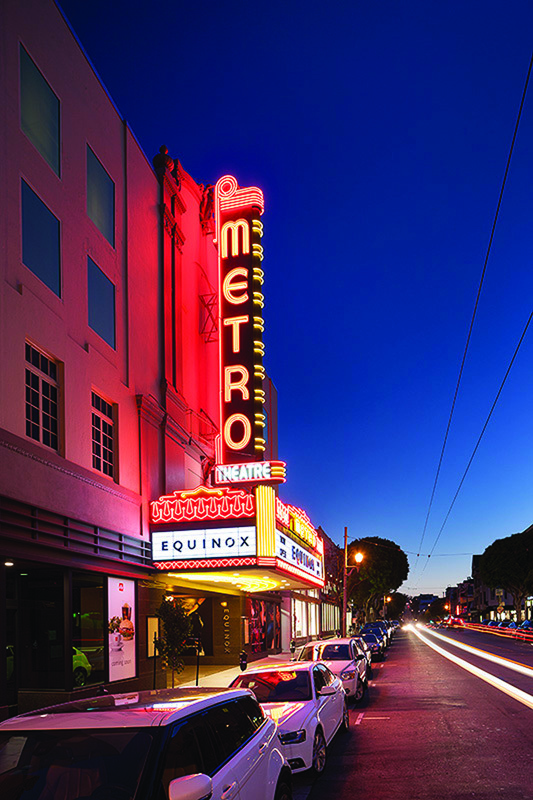 Equinox’s adaptive re-use of the Metro Theater continues the company’s tradition of developing locally-inspired design in iconic facilities. After over six years of careful planning and working with city of San Francisco’s Historic Preservation Commission, the S.F. Neighborhood Theater Foundation and numerous community groups, Equinox was able to entitle the conversion of the historic building. “Along with the award winning firm AvroKo, the Equinox design team worked to preserve a number of the original Art Deco elements of the historical building, including a restored ‘Metro’ theater marquee and two grand Anthony Heinsbergen murals which flank the new fitness floor,” says Aaron Richter, Equinox VP of Design. “A member lounge inspired by the theater’s history serves as the heart of the club, while a two-story Group Fitness studio now occupies the former main stage.” Inside Equinox Union Street’s four fitness studios, the instructors will lead a full range of yoga, cycling, Pilates and innovative group fitness classes, including signature classes such as Barre Burn, METCON3, Shockwave, ViPR, and Tabata. Equinox’s cardio and strength training areas unite free weights and state-of-the-art cardio machines to create an inspirational setting where members can workout on their own, or with one of Equinox’s highly skilled personal trainers. Beyond the fitness floor lies The Spa @ Equinox, featuring a menu of luxurious ways to rejuvenate and pamper the body—members can select from a menu including everything from deep tissue massage and post-workout sports massage to a full range of facials and body treatments. Their first Bay Area location, Equinox Pine Street, occupies the former Pacific Stock Exchange in the Financial District. In addition to the building’s seismic upgrades, two prominent skylights and a series of windows have been added, which allows natural light to flood the interior and provide uninterrupted views of the Golden Gate Bridge and San Francisco Bay. Currently Equinox operates sixty-six upscale, full-service clubs in the USA and Canada. Since its inception in 1991, Equinox has developed a lifestyle brand that represents service, value, quality, expertise, innovation, attention to detail, market leadership and results.